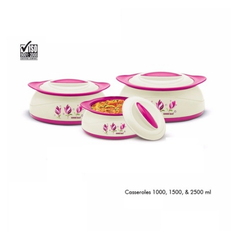 Prominent & Leading Manufacturer from Vapi, we offer belleza 3 pc set insulated casseroles. Introducing Belleza Insulated Casseroles this unique designs from VM Group has changed the "shape" of the Casseroles industry! It's Unique design is user friendly and trendy. Our dedication to Casseroles product line is evident in the number of offerings, which ensures you will find the perfect Casseroles for any occasion!With the support of our well developed manufacturing unit, we are producing a wide range of insulated casserole named as Good Day casserole. These are made from superior quality of PP, stainless steel and available under the brand name IPS.